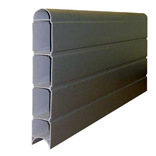 Angel Plastics are pleased to offer the Eco Composite Fencing System which is covered by a 20 year guarantee. This fence system is extremely easy and quick to fit and will complement all gardens. The system is available in 3 colours so please click on your desired colour below. Eco Fencing systems have the strength, in independent testing Eco Fencing proved it has greater tensile strength than concrete posts. The posts are deigned to be flexible and so absorb and dissipate the energy from strong winds. Concrete posts will not flex and can break in high winds and severe storms. Eco fencing systems will not chip like concrete posts and bases, this often occurs in transportation and installation. Once erected Eco Fencing DOES NOT require maintenance for protection against rot and decay. Eco fencing will weather naturally just like any other outdoor product and will become lighter in appearence over time, woodgrain will accept a timber stain should you wish to freshen up your fence in years to come. The classic can be sprayed with an aerosol paint available from automotive stores. An extensive choice of styles and components are available in 3 different colours. Eco fencing can be used as a complete system or in conjunction with timber fence panels. Due to its lightness and ease of use, the health and safety risks ever present with concrete fence posts are eliminated. Please note as we are replicating the characteristics of timber and working with recycled material, products will vary in shade and grain effect, different shades may also occur to form a varable appearence. Some boards will have no grain and others will have grain effect, some products may also show the inner core material. All these effects are normal and part of the manufacturing process and in no way affect the longevity of Eco Fencing. All photographs are for illustration purposes only and actual colours and shades may vary.